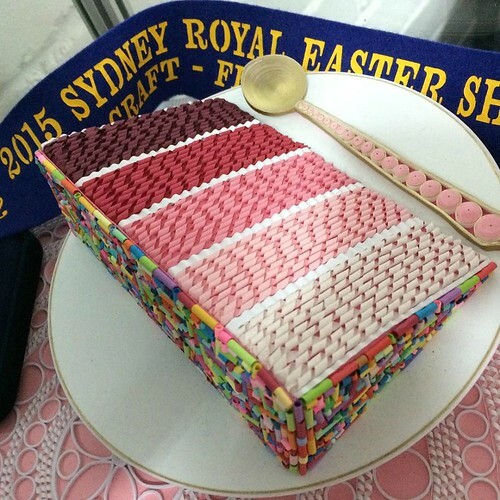 Several of the most popular posts here at ATP have been features about Licia Politis's quilled entries in Sydney's annual Royal Easter Show. You might recall her bird cage, babushkas, Day at the Races and tea set. 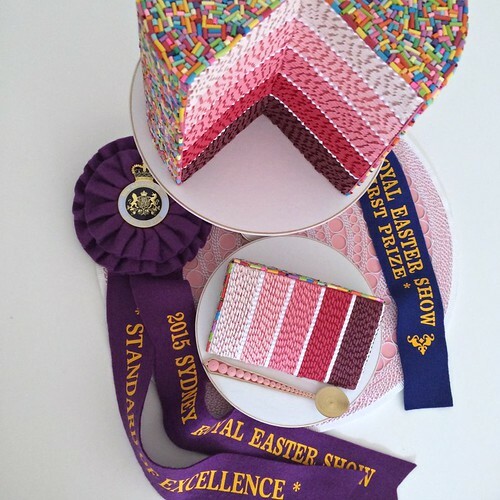 Earlier this year, ribbons were awarded to Licia's Ombré Cake - First Prize and Standard of Excellence. Have a look and learn about her process of making this wow-worthy design. Licia admits completing a project of this magnitude takes a great amount of persistence. In fact, at one point she was very close to stopping, but with encouragement from her daughters she kept at it... truth be told, the words were something along the lines of not being a drama queen. :) Despite loads of crossroads, trials and errors, to her own amazement Licia finished the piece and delivered it to the show with only a half hour to spare! 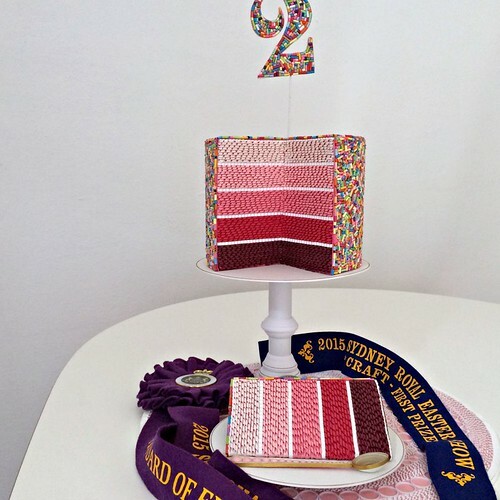 The cake with a cut out slice stands approximately 5 inches (12.7 cm) high x 6 inches (15.2 cm) wide. 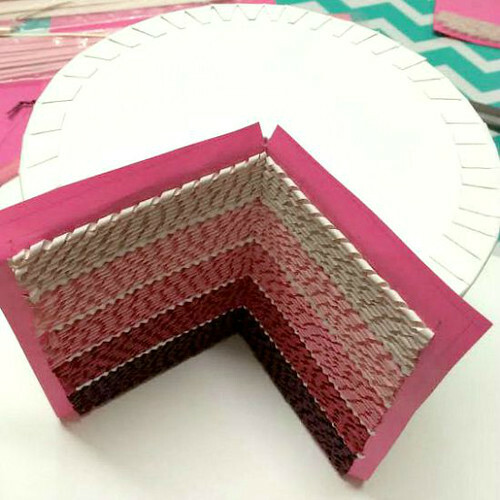 It sits on a circular pink card stock base that features a lacy repeating pattern of white ring coils and spirals in .06 inch (1.5 mm) paper. The base is 15.5 inches (40 cm) in diameter. The remarkable evenly rolled spirals were made with 0.2 inch (3 mm) width paper. Licia credits seeing Gunjan Aylawadi's paper art on Instagram as the inspiration needed to give spirals a try. At this point, she had been experimenting for two days with crimped strips and closed loose coils without success. Licia engineered a cardboard base on which to attach the confetti sprinkles and spirals. The cake sits atop a white mat board cake plate, as does the separate cake slice. She had these circular pieces cut at a frame shop and added a quilled tight spiral of .06 inch (1.5 mm) metallic gold paper along the outer edges for approximately .08 inch (2 mm) and then finished it with white for another .08 inch (2 mm). "It wasn't a difficult piece to quill... not loads of techniques, but I found it extremely difficult to execute the modern style of the cake. The number two cake topper challenged me the most. This part was the piece I was working on when I made the decision to stop, but eventually continued on. I do like the way it turned out, but the other attempts were absolutely disasters! Flowers as a topper didn't seem appropriate, yet quilling and flowers go hand in hand. 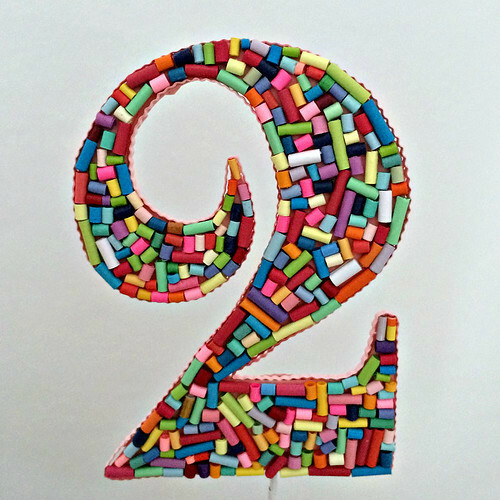 I had to think of other ideas and decided on a birthday cake number." 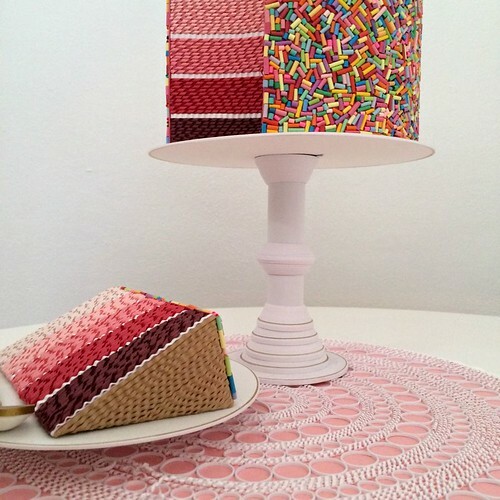 The outside of the cake and the slice are covered with more than 7000 rolled paper confetti sprinkles or 'hundreds and thousands' as the shape is called in Australia. Making the sprinkles took approximately 30 hours and an additional 24 hours to glue in situ. For the spoon, Licia used a combination of metallic gold-edge and pink papers. To keep up to date with Licia's latest projects, follow @paper_to_jewellery on Instagram. This is just amazing. I can imagine Licia wanted to give up....I would have felt the same. Kudos to her for sticking it out and the reward was well worth it. That really is gorgeous and so creative! Outstanding creativity and tenacity to finish all those tiny details. Just brilliant. I can only agree with others. What a tremendous effort. Both creative and inspiring. Another Masterpiece! Congrats to Licia, I really love all her quilling work. Wow, this is gorgeous! I saw this a few days ago on another site briefly, but not all of the close up pics like this. The confetti looks so festive! 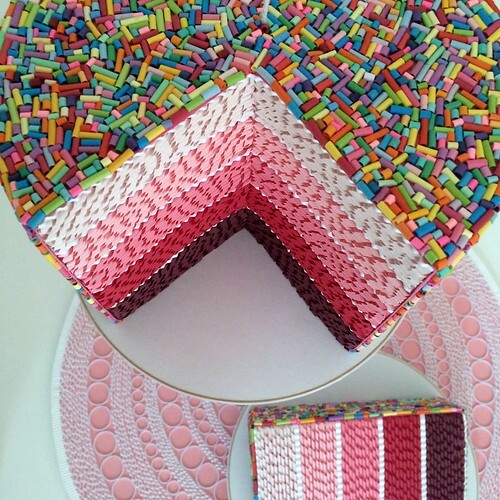 In real life I am not a fan of cakes filled with food coloring, but with paper cakes? Bring on the color! !